I chased a gull and I liked it. But not just any gull. A history-making gull. The kind of bird most of us never see if we live to be 100, or even have the chance to see. It’s only February and the Bird of the Year for Illinois is all but locked down. In fact, it was booked on the second day of 2015. 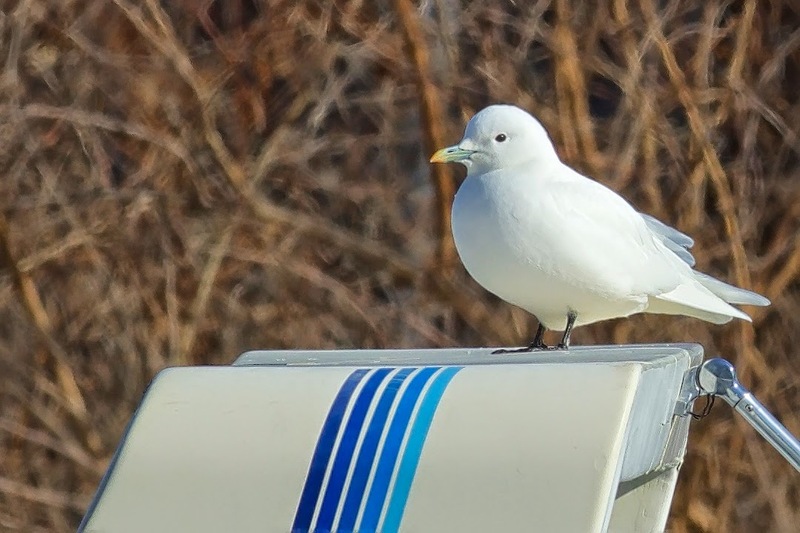 That’s when an adult ivory gull turned up in Quincy, lighting up RBAs (rare bird alerts) throughout the Midwest and beyond. I was in San Antonio at the time, wrapping up a post-Christmas family vacation. The gull was completely off my radar since I’d unplugged from the Illinois birding listserve before heading south. So it was a shock to see all the postings shortly after we touched down at Midway. An ivory gull, really? What’s it look like? How rare is this? Where’s Quincy? I had some catching up to do. In short order I learned that the ivory gull is a pure white bird of the Arctic Ocean, with black legs and a yellow-tipped bill. For a gull it’s on the small side. The last sighting around here occurred in 1992, in Chicago, two years before I took up birding. Prior to that, Waukegan, in 1949. I also learned that Quincy is a Mississippi River town, closer to Hannibal, Mo., than Glen Ellyn is to Chicago. Getting there and back is no easy day trip from DuPage. At least not by car. Amtrak, however, chugs over to Quincy every day and at least two birders chose this carbon-saving option out of Chicago’s Union Station. They got the bird, too! Bagging an ivory gull via 600-mile roundtrip train service in one day is an awesome achievement. I suspect the birders enjoyed a cold beverage in the Amtrak club car on the way home. Well done! My own travel options were few. The gull continued to be seen the first full week of January but I was back to work by then. Dozens of birders were planning a road trip to Quincy on Saturday, Jan. 10, eight days after the discovery. I was leading a walk that day at Cantigny Park. After the walk I checked the listserve for any news from Quincy. At 10:14 a.m. a birder from Galesburg reported that so far the gull was a no-show. Only two more updates posted the rest of the day, each one negative. 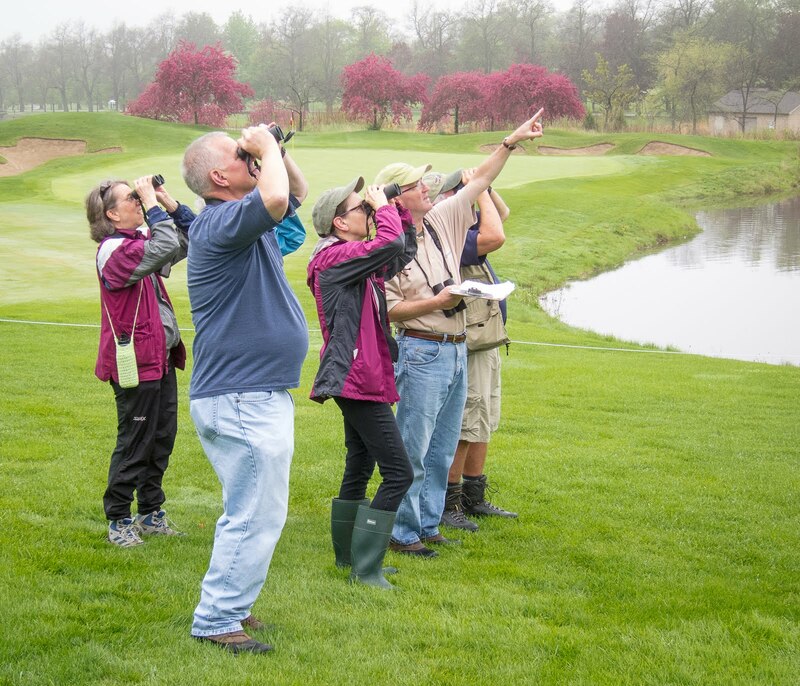 I felt bad for all the birders gathered in Quincy—people who waited all week before taking their best and only shot at the bird of a lifetime. Evidently the ivory gull decided eight days in Quincy was enough. The next day, Sunday, I’d be driving my daughter back to Augustana College in the Quad Cities. From there, Quincy is within range, but I couldn’t be on the scene until Monday morning, nearly three days after the last confirmed gull sighting. I had to go for it. My odds were terrible but at least I’d see some bald eagles. When Rachel chose to attend Augie I knew a parental side benefit would be some winter eagle watching on the Mississippi. It never gets old. What I didn’t expect was a quick but killer view of a rough-legged hawk, seen from the car about 50 miles south of Rock Island. The bird was flying low over the snowy open fields and crossed the road right in front of me. That moment gave my Quincy boondoggle a needed sense of credibility. Monday broke sunny and cold, which of course dictated a massive breakfast at the local Village Inn. When paying my bill I asked the manager if he’d heard about the gull or seen any other birders. He said no. Well, shame on that guy for not reading the Herald-Whig, Quincy’s daily paper. A photo and article about the ivory gull had appeared on the front page six days earlier. After breakfast I stopped by the newspaper’s office to pick one up. Sometimes you just gotta have a hard copy. It was in fact a Herald-Whig graphic artist, Jason Mullins, who discovered the gull that triggered the whole frenzy. He spotted it on the Quincy riverfront during his lunch break and then alerted some other bird nerds who confirmed his remarkable find. The newspaper included the story of a Cleveland couple who left their home at 9 p.m. and drove all night to Quincy. They got the bird. Two birders from Texas high-tailed it to Quincy as well and went home happy. My own visit to the Quincy riverfront was quiet, like a church on the day after Easter. During two hours of birding on and around Quinsippi Island I encountered only two other gull seekers, an older couple whom I’m pretty sure never left the comfort of their warm SUV. They, like me, would not see an ivory gull. Not on this day. Returning to Glen Ellyn via Quincy put an extra 325 miles on the Jetta. I’m not usually a long-distance bird chaser so that’s a little embarrassing, especially since I missed the bird. But in this case, no regrets. Some species demand the time and the miles. Besides, a morning of birding beats a day at the office any day. In Quincy I watched a pileated woodpecker from 20 feet away as it pounded away on a snag. I counted a flock of 13 great blue herons, got my eagle fix and tallied a tufted titmouse, the latter being a hard bird to find in DuPage. Perhaps best of all I experienced a new place, a river town that seems a world away from Chicagoland, and where Main Street is spelled with an “e” at the end. Now, for this birder and many others, Quincy will always be a gull town.